This section contains information on several self-guided hikes into the Scotchman Peaks Wilderness Area, so that if you are not able to join one of the scheduled Guided Hikes you will still be able to enjoy this beautiful scenic roadless area. 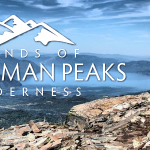 If you have questions before you go on any of these hikes, please send email to Info@ScotchmanPeaks.org but be sure to ask several days in advance so that we have time to answer your question. The trail along Morris Creek provides a lovely walk in the woods, with a moderate elevation gain and occasional glimpses of the peaks towering above. The trail keeps to the north side of the creek, crossing a couple of seasonal side stream, switch backing occasionally and providing some cool relief from the summer sun. At about 2.5 miles, the trail crosses the main stem of Morris Creek and then switchbacks up the south side of the valley, through old growth Cedar and Hemlock, with mosses in the under story. This creek crossing can be difficult to impossible unless the water level is low, such as in July and August. 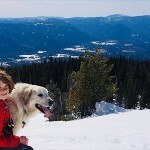 This is a lovely out and back hike that requires no specific turnaround – it can be as long or short as you would like. If you go: Bring good boots or trail shoes, water, snacks or lunch. Layers of extra clothing and rain gear are always advisable in the mountains. A guide to native plants could make this a very interesting trip. Driving Directions to the Trailhead: Take Highway 200 (east from Sandpoint) to Clark Fork. Turn north at the Chevron Station and follow Lightning Creek Road 419. At about 6.25 miles, you will cross Morris Creek. On the north side of Morris Creek is a small turnout. There is a small sign marker with the number #132 on it. High quality maps are available! 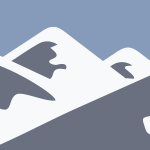 The Friends of Scotchman Peaks Wilderness, with support from the Idaho Conservation League, has produced a high quality hiking map for the Scotchman Peaks area. 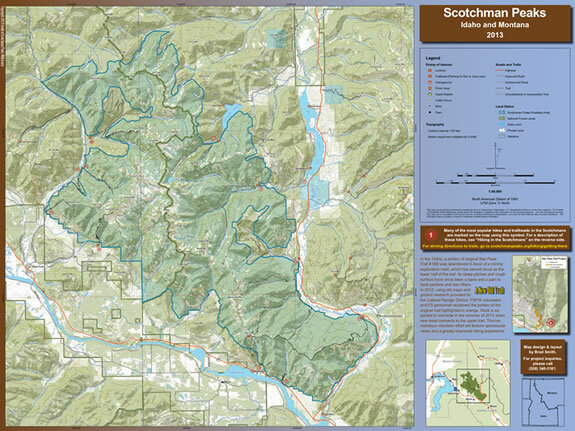 This full-color, shaded relief, topographic map shows maintained trails and trail head access routes on one side. The other side of the map has information designed to inspire as well as assist in trip planning. You can pick up your FREE copy at many locations throughout our communities, including those retail businesses who sell our t-shirts and other merchandise, forest service ranger district offices, chamber of congresses, or at an upcoming Friends of Scotchman Peaks event. Please see our Store Page or our Maps Page for a list of local retailers where you can find our Maps and other merchandise. High Resolution downloadable copies of the Map only are also available on our Maps Page.